“Handel’s Messiah oratorio is recognised as one of the four major choral pieces performed in Western Classical Music.” A statement from an article in today’s Borneo Post newspaper about a forthcoming performance of Messiah in Kuching. Newspapers – especially local ones with limited access to expert knowledge - are adept at making claims which they cannot and do not substantiate, and I imagine the reporter here simply jotted down a phrase from a press conference without noting what else was said. Which leads me to think of suitable candidates for the other three pieces. 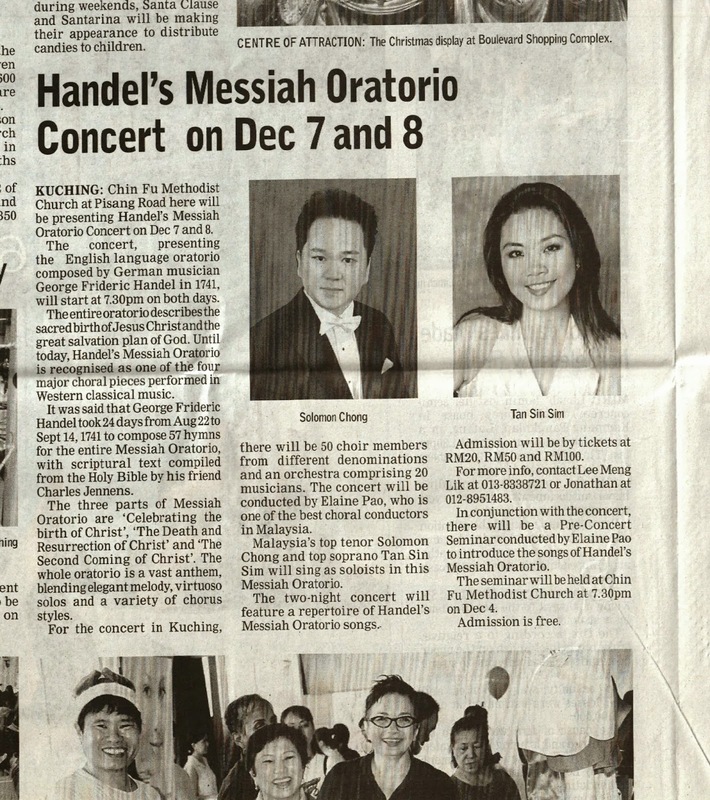 (And how refreshing, if odd, to describe Messiah as a “piece” rather than as a “song” - although the joy is shortlived; later in the article comes the lovely phrase which grotesquely mangles the English language; "a repertoire of Handel's Messiah songs" ). Bach’s St Matthew Passion and B Minor Mass have to be two of the others, would anyone disagree with that? But what can the fourth be? It does not specify that the other major choral pieces are sacred, but certainly there are plenty of sacred ones in the running. Mendelssohn’s Elijah, Elgar’s The Dream of Gerontius, Fauré’s Requiem, Mozart’s Requiem, Beethoven’s Missa Solemnis; they surely are leading the pack. However can any of those really stand alongside the Bach and Handel offerings? Both Mendelssohn and Elgar have their detractors, in a way which the Bach and Handel do not - musicians who justifiably point to innumerable solecisms and weaknesses in both scores and texts. The Fauré is quite lightweight in comparison with the others, while the Mozart… Well, it’s not by Mozart so you have to decide which completion you would list as the most important. As for the Beethoven; great music, certainly, but so wholly unsympathetic towards the human voice it has to be discounted on the grounds that it is out of the reach of most choirs. And, by that token, we must probably also rule out the Verdi Requiem and Berlioz Grande Messe de Morts. I would be tempted to suggest that the fourth work is Haydn's Creation, but is that a better work than The Seasons or even some of his sublime Masses? The creation in the 19th century of what we call the “Classical Canon”, that list of composers and works decreed by certain 19th century musicologists as being the apogee of musical creation, has led most to believe that great music can only originate from the 17th and 18th centuries, with a few exceptions reaching into the 19th. So we tend to imagine that those “four major choral pieces” will be of that vintage. But let’s forget those outdated notions, and look to music written in the last 100 years. With the centenary of Britten this year, the War Requiem has been very much to the fore in the field of choral music, and there are many who would undoubtedly list this as the missing piece. Not for me, though; as with Mendelssohn and Elgar, its flaws are too numerous to be ranked alongside Bach and Handel. Even my very favourite 20th century choral work, Walton’s Belshazzar’s Feast, could hardly stand comparison with such august company. Schoenberg’s Gurrelieder must be in with a chance, given its monumental stature, while choirs have developed such a liking for the atmospheric doodlings Eric Whitacre and his chums, that I suspect there are quite a few around who might tentatively put their names forward without, perhaps, daring to suggest a single work. It has not really crossed my mind before, but if asked to list the greatest choral works ever written, I can only think of three. What does the Borneo Post know, that I do not? I'd certainly go for Beethoven Ninth! Surely it *is* entirely choral as it is the Choral Symphony! Entirely choral except for three out of the four movements. How about the German Requiem by Brahms? Or we could give Bach another spot with the "St. John's Passion'? Agree with Anon above, I'd vote either for St John's Passion or for Mozart C minor mass.